PITTSFIELD — Clothing and toiletries sat in a clear plastic bag beside a bunk bed in the women’s area of Barton’s Crossing. A hairbrush rested atop a plastic set of drawers in the four-person room on the second floor. The hallway swung around a corner, and then took another tight turn into a room full of cots used as emergency shelter for incoming women. Cool air seeped in through blankets tacked to the window frames. All told, about 37 people slept there Thursday night. Barton’s Crossing is a destination for those who have nowhere else to go. But now it’s the county’s largest homeless shelter that needs a place to land. The tired, hulking building at 1307 North St. isn’t a good fit for the shelter’s needs, say leaders of ServiceNet, the agency that operates the facility. The old lodge’s sprawling geography makes it difficult to heat and to supervise — especially in light of tight budgets and a small staff. Plus, they said, its location about a half-mile south of Pontoosuc Lake makes it difficult for people who use the shelter to get there each day. Shelters are usually in downtown areas, said Jay Sacchetti, ServiceNet’s vice president of shelter and housing, because the people who use them need access to transportation, social services and doctor’s appointments. “It’s all those things they need to break the cycle of homelessness,” he told The Eagle on Friday, during an interview at the shelter. 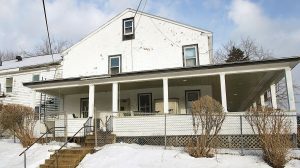 For all these reasons, he said, the agency is considering relocating to First United Methodist Church on Fenn Street — in the heart of downtown. The agency is exploring whether two long hallways in the building would be feasible and cost-effective to renovate. Whether the shelter looks to move to Fenn Street or elsewhere, he said, he is looking to wind to a close the six-year search for a space. ServiceNet took over Barton’s Crossing in 2012, after state officials approached the agency, Sacchetti said. He said the Berkshire Community Action Council was in charge of the North Street operation at the time, but was looking to get out of shelter work. The agency operates three programs out of the building: year-round emergency sheltering, winter sheltering and supported permanent housing. Ideally, emergency and winter sheltering would run separately from supported housing, which they said they would ideally run in independent residential settings. 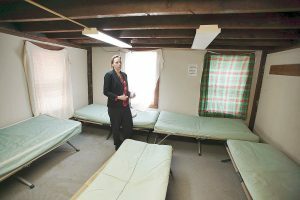 The women who stay at Barton’s tend to be a more regular group than the men, shelter site manager Cheryl Bassett said, because men have the option of rotating in and out of available beds at Soldier On. But agency policies prohibit them from leaving their belongings in the room during the days, “Which is hard for them,” Bassett said. The shelter shuts down from 8 a.m. to 4 p.m., save for weekends, holidays and bad-weather days. The building’s hallways are full of right angles that make security monitoring difficult, Sacchetti said. “We have the hallway cams, but it doesn’t get all the nooks and crannies,” he said. 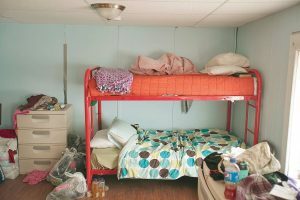 Emergency housing, like this dorm room for women, is a little more comfortable than winter housing. Barton’s Crossing, run by Service Net, is a multi purpose shelter on Upper North Street in Pittsfield that serves as emergency housing and winter housing for the homeless The building is sprawling and old and difficult to manage. And the layout of the building poses challenges for two overnight staffers working to keep occupants safe. “A lot can happen,” noted Erin Forbush, ServiceNet’s director of shelter and housing. Most of the people taking shelter in the building have addiction issues, Sacchetti said. Guests are searched upon entry each night, and are not allowed to bring in any illicit substances. “We’re willing to work with them as long as everybody is safe,” Forbush said. Ideally, they said, the shelter would run out of barracks-style hallways, which would allow for better line of sight and easier supervision. Forbush said the dream is to have a facility that lends itself better to the work they do. “For what we have, we do really well,” she said. Staffing is tight because the budget is tight. Sacchetti said about 75 percent of the shelter’s $270,000 annual budget goes to labor costs. Each year, he said, the shelter operates on a $13,000 deficit. “Donations have decreased dramatically,” he said, and federal Community Development Block Grants funneled through the city have continued to dwindle each year. ServiceNet shelters in Northampton and Greenfield are able to fill in the gaps with donations from residents and community organizations, but there isn’t that same level of financial support in Pittsfield. “There’s hopefully more funding streams loosening up,” he said, referencing the possibility of grant funding. Meantime, Sacchetti said the commonwealth has seen a 14 percent increase in homeless numbers over the past year. He attributes that increase largely to increasing demand in Western Massachusetts. It’s because rents are rising, he said, and the availability of single-room occupancy is decreasing. A countywide winter shelter program serves about 200 homeless people a year, Sacchetti said. Most of those people wind up at Barton’s Crossing. The demand for beds is not seasonal. “It never stops,” Sacchetti said. Finding a new building that can accommodate dozens of beds isn’t easy, Sacchetti said, and then agency leaders have to consider how politically tenable the location will be. They’ve seriously considered about 15 sites over the past five years, he said. Disqualifying factors included renovation costs, and whether an area was too residential. “People don’t want it in their backyard,” he said. A location downtown makes the most sense, he said, because homeless people already spend most of their time there during the day. “All those folks are already there,” he said. Ward 4 Councilor Chris Connell said he saw the value in a downtown shelter, but it might not sit well with those working to revitalize the city’s downtown. Ed Carmel, who formerly was homeless and now is chairman of the city’s newly-minted Homeless Prevention Committee, said he’d like to renovate a downtown building and use it to give the city’s homeless what they need. “Those who say we don’t need a shelter in downtown Pittsfield should take a look at themselves and say, ‘Hey, these are human beings,’ ” he said. “We try to site things in places where they’ll be more accepting,” Sacchetti said. Even if the agency decides to pursue a shelter at First United Methodist, Sacchetti said the push for funding hasn’t yet begun. He hopes to see support from the community as the agency inches forward with a new site, he said, because the people who need help aren’t going anywhere. “We don’t anticipate this problem getting smaller,” he said. There is a group of homeless people in the area who are aging, he said, like those that previously worked for General Electric Co. before it downsized, and will need more care in the coming years. Amanda Drane can be contacted at adrane@berkshireeagloe.com, @amandadrane on Twitter, and 413-496-6296.